Students at Casili Elementary School have to cross a river every time to attend classes. As such they are at risk. Thus, volunteers from UP Mountaineers, goToTo.org in coordination with SMART is providing a few sessions of Basic Swimming lessons to them. As featured on GMA 7's 24 Oras. Jose "Jyoti" Arcega, Swim Trainor, loves swimming since he was a kid. He is a member of the Philippine Amateur Swimming Association, a volunteer of the Red Cross Quezon City, a member of the Triathlon Association of the Philippines and has years of experience as a multi-awarded competitive swimmer on both the local and regional level. He has coached several multisport teams that competes both locally and internationally. He has also helped individuals produce strong swim splits en route to numerous podium finishes. He is a vegetarian and teaches yoga at Ananda Marga in Quezon City. He is the founder of TriSwimJose.com. Ramon Vizmanos, Swim Trainor, is methodological in everything he does. He is also responsible in coming up with the Toto Program on how to condense swimming lessons in couple of days. He is a member of the UP Mountaineers (UPM) and has been its ERC head two times already, a position that is highly regarded in the group as the person is in charge of teaching the applicants basic mountaineering courses. He is also a member of the UPM Search and Rescue Team. He has been a swimming instructor at Aqualogic, the Philippines' recognized partner of the Total Immersion program. As he loves the outdoors, he is a member of Paules Outdoor and the Gaia Exploration Club. He is also a certified Emergency Medical Technician. Ramon loves cycling, mountaineering and used to do triahtlons in his younger years. IIlie Lionel B. Gramata, Legal, is a smart, practical guy that ensures Go TOTO covers its bases. During his law schoold days, he was a noted student-leader, having held the positions of Student Council President in San Beda College and National Secretary-General of the Association of Law Students of the Philippines. He has received his Bachelor of Laws from San Beda College and has obtained his Bachelor of Science in Applied Economics at De La Salle University. He was admitted to the Philippine Bar in 2002. He is a partner at Valenton Gramata Loseriaga Law Office. He is into dragonboat rowing, sculling and mountain biking. Sinag De Leon has always been a nature lover and an outdoors person. She got into swimming early on at age 13 joining the UP Integrated School (UPIS) Varsity Swimming Team and eventually becoming the Team Captain. During college she was recruited to join the University of the Philippines Varsity Swimming Team in Diliman and was also elected Women's Team Captain in her senior year. Through the initiative of swim coaches Noel K. Rivera and Bernie Cavida, she got into triathlons in 1993 and became a member of the National Triathlon Team from 1997-98. She joined adventure races in 2002, as well as Ironman Triathlons, finishing twice in the Australian Ironman Triathlon (2002 & 2004). She also got involved in running and dragonboat rowing. Read more. Judy Malabanan, Communications, is dedicated to putting her pen to good use by raising awareness about survival swimming for Filipino children. Her love for kids, belief in the written word, and passion for sports have anchored her to Go Toto's vision and mission. During her college days studying BS Communications Technology at the Ateneo De Manila, she was the team captain of the Ateneo Rowing Team and competed internationally as a figure skater. After college, she got involved in environmental activism working with Greenpeace Southeast Asia as the Fundraising Manager. She now works as the Marketing Head of a rural bank, while continuing her passion of writing content for event groups and publications. Her idea of a quiet day is a long run and spending quality time with her husband, son, and pets. Mark Dinong, Artist, is a creative person. He shares his graphics and website design skills to Go TOTO so that we can have this pro looking website. He has done countless website designs, he loves to draw and doodle Manga and Chibi characters in his pastime. He is the lead artist in the mobile game SIPA, the first Filipino-themed game on iTunes and Googleplay. He's fond of eating but never gets fat. He has a great voice and loves singing He is a naturally happy person, always smiling and sharing stories and corny jokes. With all his creative talents, he remains very humble at heart. He runs every time he gets a chance. 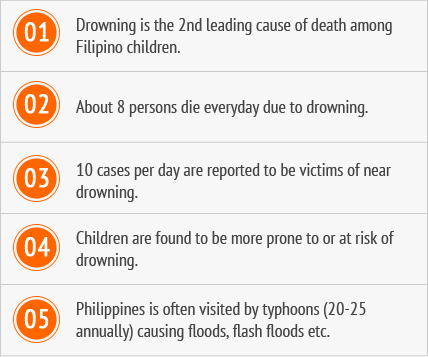 It is estimated that about 80% of Filipinos DON'T know how to swim. If one knows how to swim, one may save oneself or even others during accidents in water activities or dangerous incidents like flash floods. Although, there are many swimming schools, they are usually cost prohibitive and hardly available in rural areas. In addition, most public schools, if not all, do not provide swimming lessons, simply because they don’t have pool facilities. Formulating a “Basic Survival Swimming” (BaSS) Program that will be able to teach kids basic swimming in two 2-hour sessions. Teaching the BaSS program to other Trainors/Coaches from all over the country so that that they may be able to teach and spread the techniques to other kids. Setting up weekend swimming workshops. TOTO is the nickname of Muelmar Magallanes, an 18 year-old young man who sacrificed his life saving more than 30 people (many are mothers and kids) from being swept away by ravaging flood during the onslaught of tropical storm Ondoy (one of the worst typhoons in Philippine history). Even with the flood deepening, he kept on coming back to save more people until a solid wall collapsed that killed him. He was named as one of the Top Ten Heroes of Time Magazine in 2009. We are naming this advocacy in his honor so that his heroic efforts will never be forgotten. His swimming skills have saved many people. Through this advocacy, we are hoping that many kids will be able learn not just survival swimming but also the value of helping others in times of needs. Go TOTO is a non-profit program. It is never intended to make money. Nor it does intend to charge fees to kids who would want to learn swimming skills. Although the volunteers are willing to provide work for free, there would still be expenses for logistics to run the program. As such the most direct way for you to get involved is to fund a swim program. Every time you fund a program on Go TOTO, you help grow our community, expand our reach, and spread our message. We are always in search of talented individuals like you! If you've got skills to share, email us at support@GoTOTO.org and tell us something about yourself. Like us on Facebook to get the latest news, updates, and information! Because we are committed to using 100% of your donation to fund swimming programs, we rely on donations from people like you to grow our impact. Donate to Go TOTO's operational costs. Invite friends, family, and coworkers to join the Go TOTO community and possibly fund a swimming program or simply Like us on Facebook! Please email us at support@GoTOTO.org and we will get back to you right away!